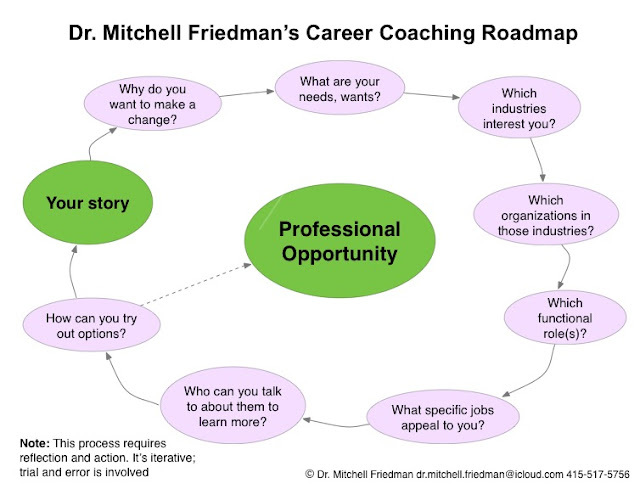 Here's a visual representation of how I work with individuals as a career coach. The process applies whether you're looking for a job, intending to change industries/professions, and/or transitioning to a new career (and stage in your life). Can I help you address these or other career challenges? Let's set up a complimentary 15 minute phone call to discuss them. You can reach me at +1-415-517-5756 or at dr.mitchell.friedman (at) icloud.com.